It’s fair to say that the intestine is not the part of our anatomy we are most passionate about. No famous poet has written an ode to it, and artists are not normally inspired by its “beauty.” Quite the opposite, in fact. The most common view of the gut is that it is an ugly body part that looks a bit like a snake, smells bad, and sometimes makes socially unacceptable and embarrassing noises. However, I promise you that we have a true second brain in our gut, and its neuronal function is very similar to that of the brain in our head. Inside our belly, there is an extensive network of neurons located between the two muscular layers of the digestive system walls. Moreover, the structure of these digestive system neurons is identical to that of neurons in the brain, and both produce similar chemical molecules—neurotransmitters and hormones that are mostly necessary for our intercellular communications and the correct functioning of the body. Let me introduce you to the enteric nervous system (ENS), our “second brain.” This is not a metaphor; it is a recognized term accepted by medical professionals. The importance of the ENS was only demonstrated relatively recently with the publication of the work of Professor Michael Gershon, chairman of the Department of Anatomy and Cell Biology at Columbia University, New York, and the forerunner of the new science of neurogastroenterology. This new area of specialty studies the symptoms of psychosomatic upsets that have a gastrointestinal expression and relates them to the central nervous system (CNS). Gershon has spent thirty years of his scientific career on an in-depth study of the attitude and behavior of the human gut, and he has confirmed that our digestive nervous system has its own cerebral activity and intelligence. His book, The Second Brain: A Groundbreaking New Understanding of Nervous Disorders of the Stomach and Intestine (1998), was a significant step forward in information on the ENS, advancing the existing medical and scientific understanding of the subject. According to new data, the total number of neurons found in the small intestine is around a hundred million. This figure represents considerably more neurons than in the spinal cord, for example. The brain in our gut is the main production line responsible for producing and storing the chemical substances called neurotransmitters, most of which are identical to those found in the CNS, such as acetylcholine, dopamine, and serotonin. These substances regulate our moods and our emotional and psychological well-being. They form a group of essential substances ensuring correct communication between the neurons and the body’s warning system. They represent the “words” in the neuronal language. 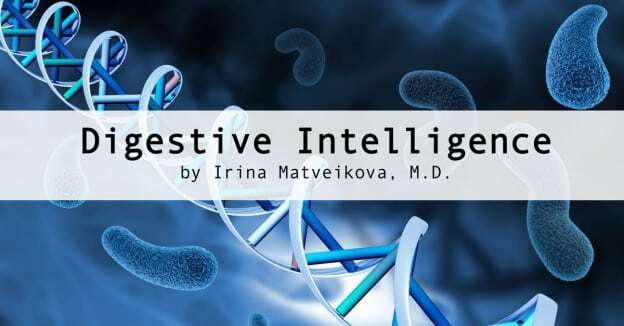 The presence of such a wide variety of neurotransmitters in our intestines is a clear indication of the complexity of a rich digestive language, and the ability of the ENS to carry out neuronal functions and express its own emotions. Gershon revealed that 90 percent of serotonin (the famous “happiness” or “feel good” hormone) is produced and stored in the intestinal walls, where it regulates peristaltic movements and sensory transmission. Only the remaining 10 percent of the body’s serotonin is synthesized in the neurons of the CNS’s brain, our “higher brain.” The lesser amount of serotonin in the higher brain is, nevertheless, of vital importance for human beings. It performs various functions, including regulating our mood, appetite, sleep, and muscular contractions, and it plays a role in cognitive functions such as memory and learning. Before Gershon’s revelation, the scientific world did not pay much attention to this aspect of the intestines and did not appreciate the nerve network that runs through them. The general view was that the decisions made by the higher brain were dominant and that its influence on the digestive system was one way; that is, the process was directed downward from the CNS. The scientific observations made by Gershon, however, now lead us to think that influence travels in both directions—that there is constant communication between the two brains: the one inside our skull and the one in our gut. The above is an excerpt from the full feature, which goes on to detail the restoration of gut microflora with probiotics and prebiotics; readers may purchase Vol. 24, No. 1, January/February 2015 (available in print or digital format) of the Well Being Journal to read the full excerpt.